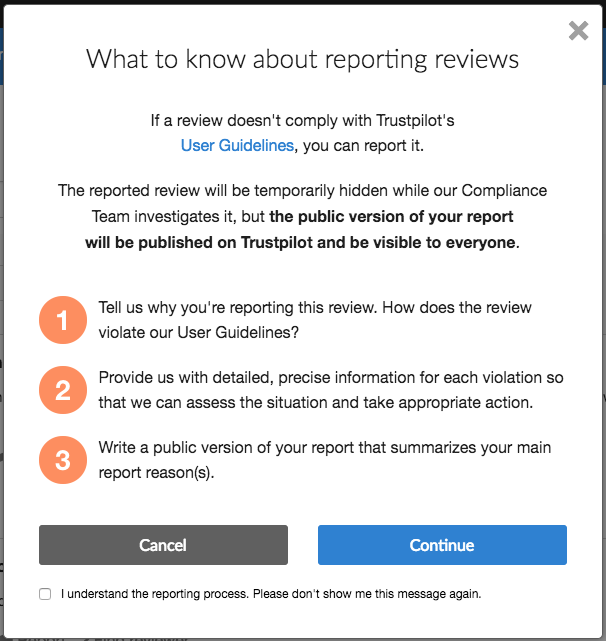 Businesses can report reviews that violate our guidelines. They should do so using their Trustpilot business account, and must provide a public reason for reporting. If a review doesn’t meet our guidelines, you can report it to our Compliance Team, along with an explanation to our community as to why it doesn't belong on Trustpilot. The reported review will be temporarily hidden while we investigate it, but your reason for reporting will be visible to everyone. Customer reviews are the essence of Trustpilot's online review community. We aim to provide a neutral space with trustworthy reviews that can help you learn how to improve your customer service and thereby boost your reputation. If you disagree with the reviewer about the course of events surrounding a review, we suggest that you don't report the review. We have to take a neutral stance in respect to disputes between companies and reviewers because we’re not in a position to determine which set of facts is correct. In many cases, the best option for businesses is to respond to the review by leaving a reply below it. People appreciate businesses listening to their feedback and following up on complaints. In our experience, companies that engage can win over unhappy customers, gain respect from new customers and resolve issues. Note also that if reviewers change their opinion about a company, they can update their review to reflect that. You can only report each review once, unless the reviewer updates it. To report correctly, it helps to know the reasons for which reviews can be reported. These correspond to Trustpilot's User Guidelines (UK version, US version). We also have a quick guide to our User Guidelines here. Log in to your business account. Click on Service Reviews on the left-hand side and find the review you intend to report. Below that review, click on Report. Either click Continue to create a report, or Cancel to go back to the reviews. Select whether you want to report part(s) of the review, the entire review, or the eligibility of the reviewer to write a review. Click on the drop down arrow to open each of these sections and see the different reporting options. Check the box(es) for the relevant reporting reason(s). You may be asked to provide details explaining why the review violates our User Guidelines in this way. Be as specific as possible. Click Continue when you're done. A report summary will show which reasons you've selected to report the review. Make sure these are correct. Click Back if you need to change your reasons or Continue to proceed. You can also remove individual reasons for reporting by clicking the cross in the upper right-hand corner of each blue box. 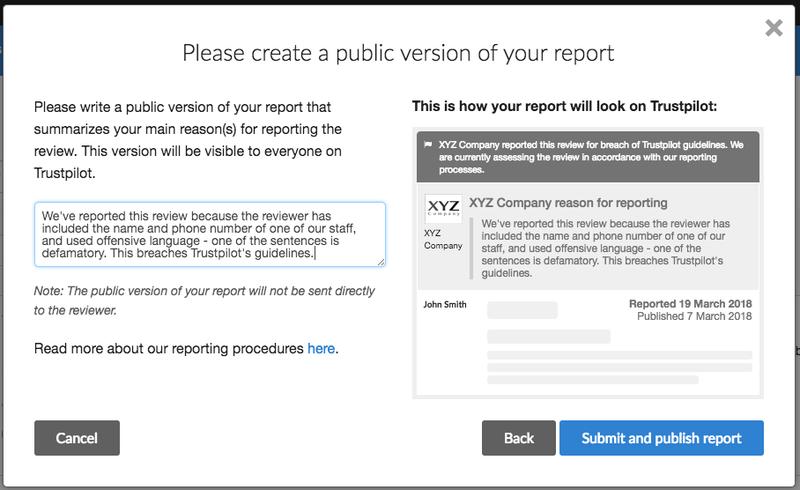 Next, a window will appear asking you to create a public version of your report. Your public reporting reason will be visible to everyone on Trustpilot. Check that you're happy with what you've written because once you've posted this text, you won't be able to edit it. 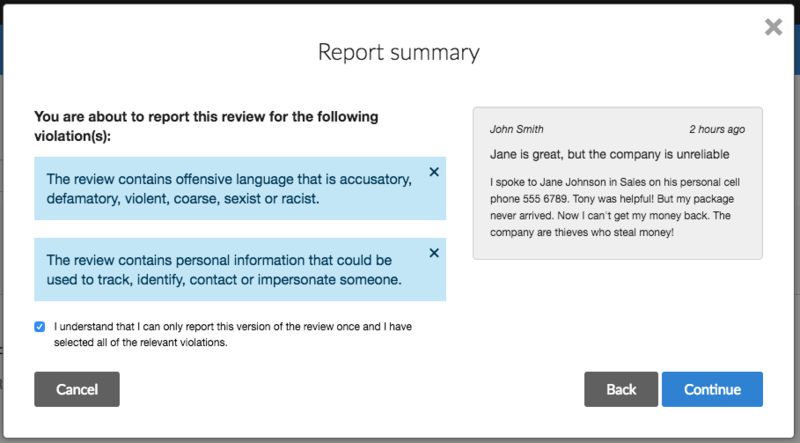 A preview showing how your report will look to Trustpilot users is shown on the right. Click Submit and publish report to send your report. The review will be temporarily hidden while we investigate it, but your reason for reporting the review will be public and visible to everyone. 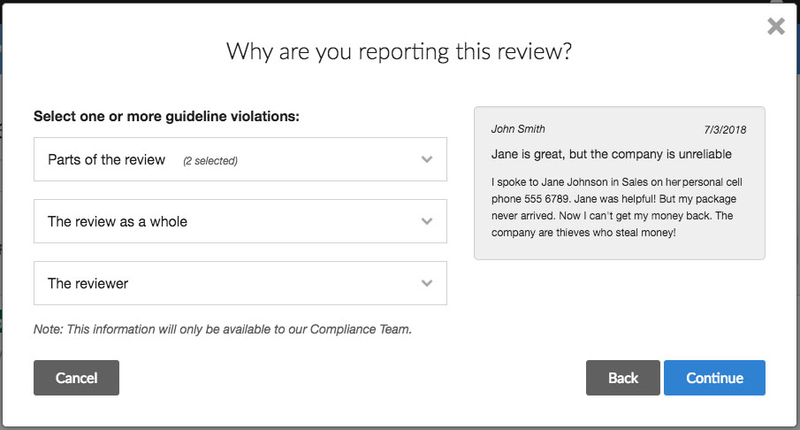 Our Compliance Team works to handle reported reviews as quickly as possible, so please be patient. Each case is different, but investigating a reported review often takes around 7 days. If we need to contact the review's author, however, it can take a little longer.